Ah, anesthetist Summertime in Miami. The thermostat hits 80 before the sun rises and the air wraps around you the second you step outside. It’s so hot and sticky, buy you don’t want to do much other than sit on the beach enjoying the ocean breeze and a cold beer. But of course, more about I have these silly things called responsibilities. Like going to work. And since I bring my lunch to work every day, I want something refreshing, a respite from the sweltering Miami heat. Something like Gazpacho. 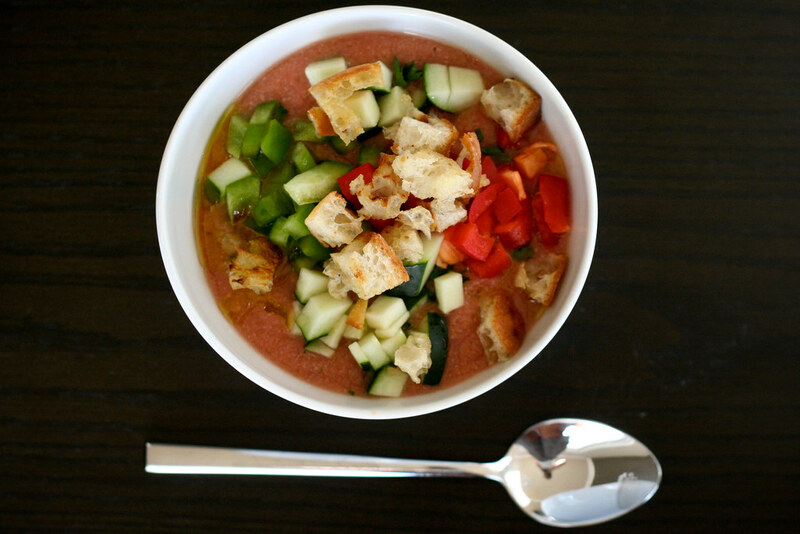 Gazpacho is the perfect soup when it’s too hot outside. 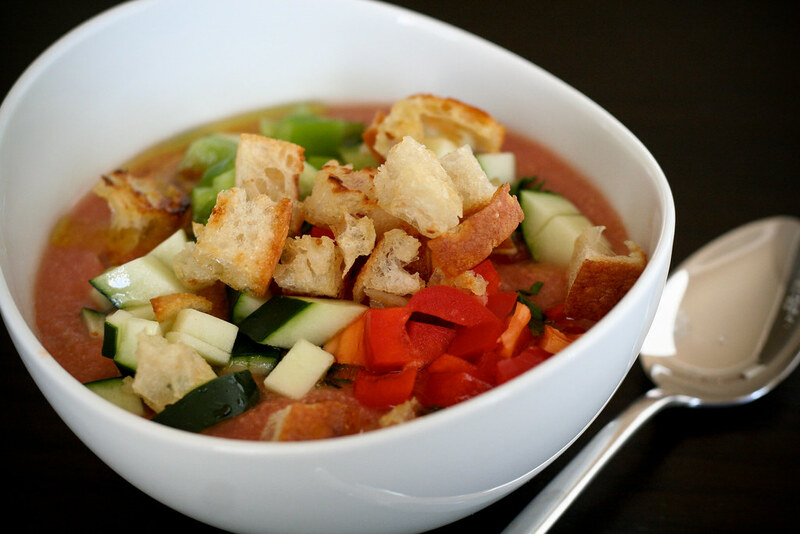 Made from tomatoes and bread, topped with crisp, fresh vegetables and croutons – it’s refreshment in a bowl. Not only is it a chilled soup, but (with a teensy tiny exception here) you don’t even cook it. I know I brag about my central air conditioning all the time, but I remember how darn hot my kitchens in NYC and Boston got in August. You don’t want to be turning on the stove, least of all to make soup. This is a more traditional recipe for Gazpacho, but feel free to experiment with your favorite crunchy toppings. I really want to try some perfectly grilled corn, but I have to wait until sweet corn is in season. Maybe some bacon, too. Maybe I’ll report back later this summer with a grilled corn and bacon gazpacho. Just think of the possibilities! Peel and seed your tomatoes. Usually I’m not a big fan of peeled tomatoes, but in this case it’s a must. Don’t worry if they look hideous, they’re going to be pureed to death. Place all of the soup ingredients in a blender or food processor and blend until very very smooth. Depending on the size of your machine, you may need to do this in batches. Let the mixture sit for 5 minutes so the flavors “meld”, then give it a couple of extra pulses.Taste and add salt or lime juice as needed. If it’s too thick, stir in some more stock. If you’re going to eat your soup fairly soon, toast the croutons. Set a large skillet over medium-high. Once it’s hot, heat the olive oil, then add the bread. Toast the bread for 5 – 7 minutes, flipping it occasionally with a spatula. You want it to turn golden and toasty. Remove from heat. If you’re not ready to eat, chill the soup for a few minutes, hours or up to 3 days. (If you’re waiting more than a few minutes, you should wait to toast your croutons at the last minute.) When you’re ready to eat, ladle the soup into bowls and top with a heaping spoonful of the cucumbers, peppers and croutons. Makes 4 entree-sized servings or 8 appetizer-sized portions. This sounds great. I had a few dinner ideas I had to abandon this week because it’s too darn hot and this is perfect! Looks fabulous. We have a ways to go in Ohio before we get overripe tomatoes, but I am always looking for a new gazpacho recipe. The only thing I would change is to add a bit of sliced avacado. Mmmmm. Gazpacho never appealed to me until now! I will make this for sure after my beefmaster tomatoes come up that I planted..yummy! Thank you for sharing! Cold soup season is here, gazpacho is one of the best. cucumber & buttermilk is good, vichyssoise too, yum. I just got back from Spain and can’t wait to try making this at home, thanks for the recipe!